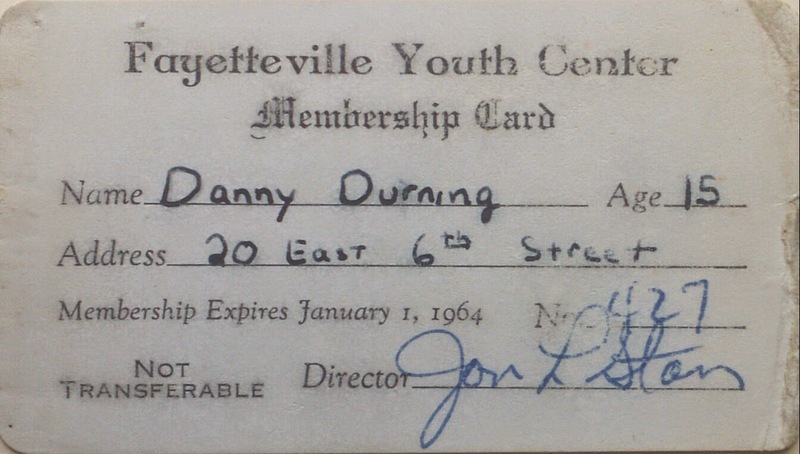 The Youth Center was a great place to hang out when I was in junior high school. After graduating from high school, I spent much time there during my first couple of years in college working part time as a basketball coach for elementary and seventh grade teams. Before the Fayetteville public library was at its present location and before it was in its previous building on E. Dickson Street, it was located up a steep flight of stairs in a building on West Mountain Street, just down the block from the Ben Franklin store at the southwest corner Mountain and S. Block Avenue . 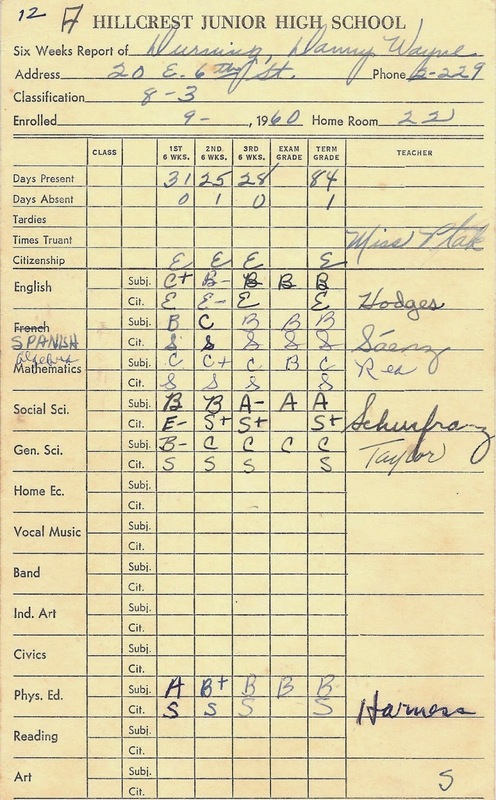 I think I started to use the library regularly when I was in the 7th grade. I checked out lots of teen books with a plot involving baseball. 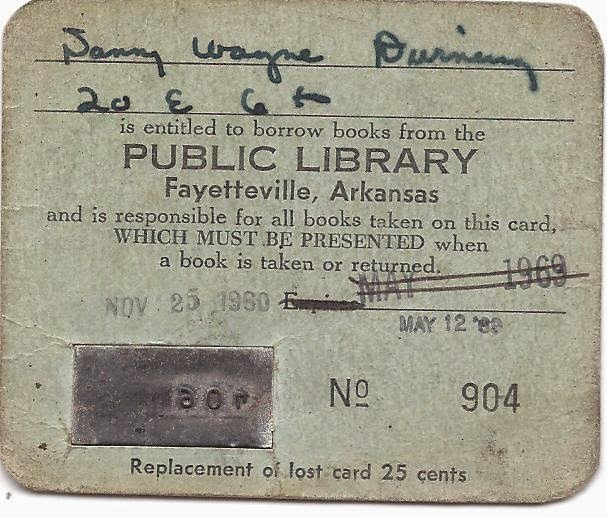 The card shown above was issued for use at the new library building on Dickson Street that had replaced the old one on Mountain Street. It was part of the latest in book check-out technology. With the card shown above, you needed only to present the card and the book to the librarian. The card was inserted into a simple machine that stamped the number onto a check-out card, along with a due date, and you were done. 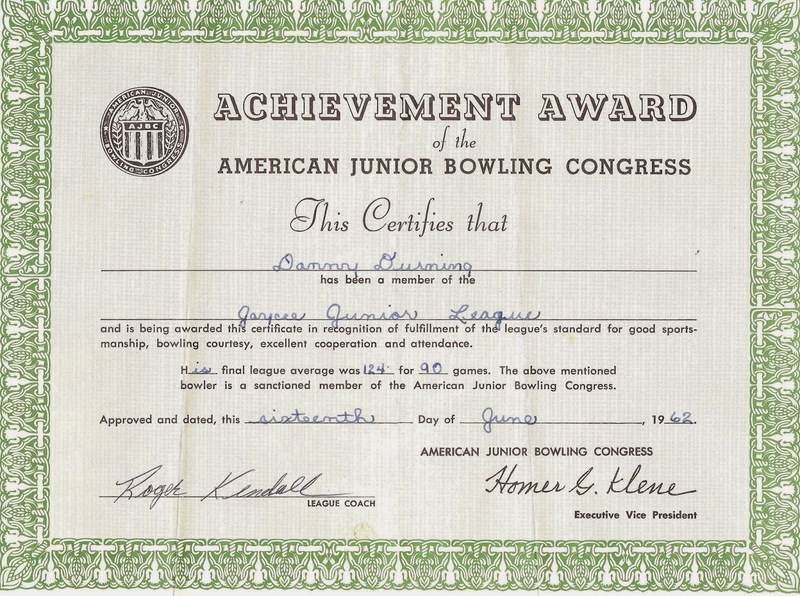 I joined a Saturday morning bowling league in 1958. To do so, I had to give up piano lessons with Mrs. Delano, a kindly woman who went to the church I attended. Her hobby was painting rustic scenes on rocks. I think took my decision to stop taking lessons with with disappointment. We both understood that I was too lazy to practice the piano regularly and had no special musical talent. While quitting the piano lessons disappointed my grandmother and my parents (they had bought me a piano), I was quite relieved to be heading to the Ozark Bowling Lanes on Saturday mornings instead of butchering some simple-minded piano tunes because of my lack of practice. My dad, who worked at the Arkansas Western Gas Co. at the time, had been in a weekly bowling league on the Gas. Co team. He seemed to enjoy it and the group of men had lots of fun. I went with him some nights and mostly hung around the pinball machines. When I had a few extra nickels, I would play a machine with a baseball game. For this game, the player controlled the bat and swung at pitches offered up by the machine. More often than not, I did not get enough runs to win extra games, but it was a sweet feeling when things went well and the I got enough runs to hear the machine giving me free games. I learned to bowl pretty quickly. An elderly man with thinning white hair ran the league taugh me the basis and was very encouraging. He seemed to always be in a good mood. 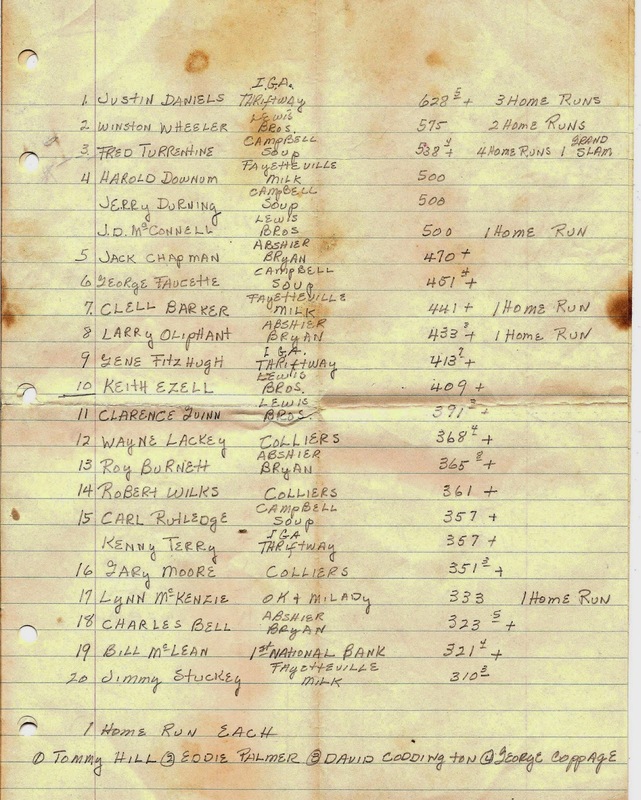 Among the other bowlers, I recall Ricky Cowen, Carl Gabbard, Larry Bentley and Newt Land. The second year, my bowling team won the league championship and ranked highly nationally. Somewhere in storage I have a trophy. I used to get it out to look at it when I started feeling bad about quitting piano lessons. My dad was a big boxing fan. One of the earliest thing I recall was going on Friday nights to watch the fights on a television in the window of the local power company. Later, before we finally got our own television, we went some Fridays to watch especially important boxing matches on a television at Wayne Stout's house on South College, a few blocks south of Jefferson Elementary. With this introduction to boxing, I became a fan and wanted to be a boxer myself. 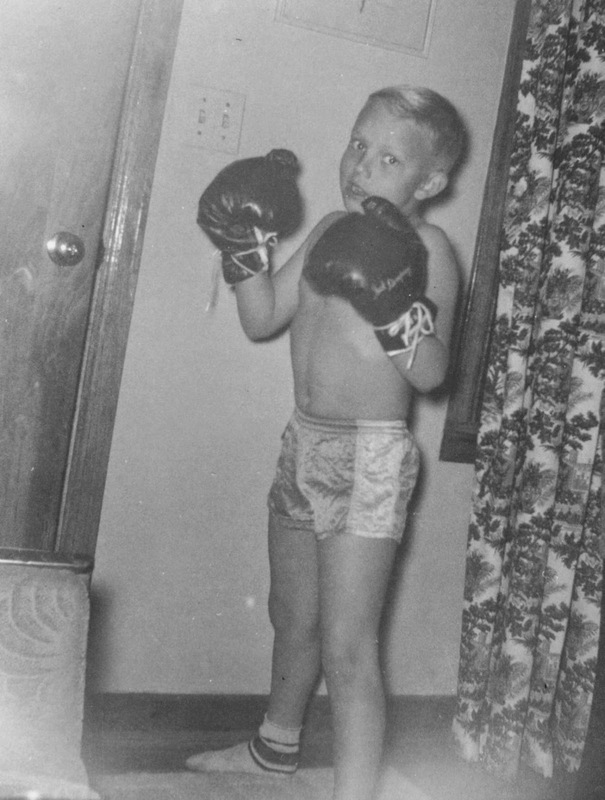 So, the Christmas when I was in the third grade (1955), I got a new pair of boxing gloves. With those gloves, a swim suit, and dirty socks, I was ready for battle (see picture above). In the third grade -- I had spent the second grade at Robert E Lee Elementary in Springdale -- I started going up the College Avenue hill from Jefferson Elementary to the gym of the National Armory to take part in the sports there, including boxing. I know it was the third grade because I occasionally got Mr. Trahan, my 3rd grade teacher, to give me a ride there. I am not sure if the Armory gym served as a Boy's Club or whether the after-school program was city-financed. I just remember there were lots of boys there every day. One of them, I remember, was an older guy (probably a teenager) who wanted to be a boxer, and he would jog around the edges of the gym holding a stool in one arm that was extended to his front. It did not look like fun and I wondered why they would do that. One of the activities at the gym for smaller kids like me -- one of its attractions -- was boxing instructions. So, I got a chance to learn the basics of pugilism and, after a while, thought I was pretty good. I was usually beating the boys I fought with ease. Then one day, Coach Joe Holt, who was working there, pulled me over and put me in the ring to fight a scrawny Black kid who was quite a bit smaller than me. I had never seen before (interesting that in 1955 the Armory sports programs were integrated but the grade schools were not). About 30 seconds into the first round, I realized that I was outmatched. My opponent was must quicker than me and he hit harder than anyone I had ever boxed. When he popped me hard a couple of times, I started wondering when the round would be over. By the end of the first round, I had had enough of this foolishness, but Coach Holt told me it was a two-round match and that I would continue. I guess he had seen me rough up some lesser opponents and wanted to let me experience such treatment myself. Or maybe it was a lesson in not quitting. I spent a miserable three minutes in the second round backpedaling, trying to minimize the damage to my body. When the fight was over, I was very happy that I still had all of my teeth, even though my dignity was badly bruised. After that day I put my boxing gloves in the back of the closet and starting spending much more time in the Armory playing ping-pong. 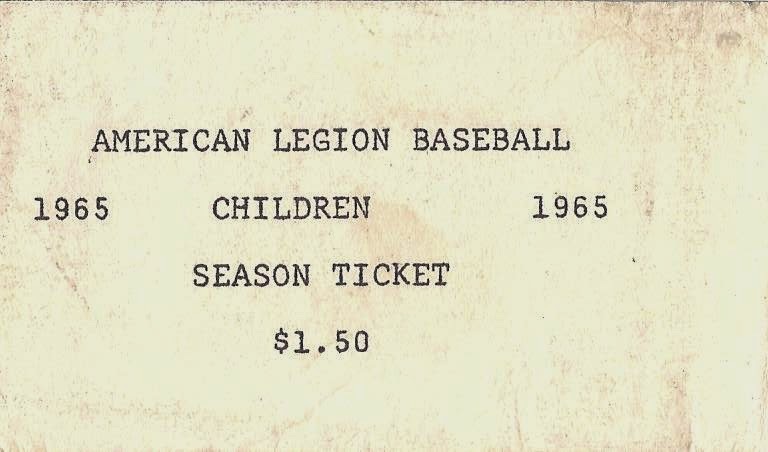 I did not recall that admission was charged to attend American Legion Baseball games. The games were held at the baseball park at the old fairgrounds, and it was fenced off, so it was possible to channel people through an entrance gate and make sure they had a ticket. Over the years, I watched and played lots of games at the fairgrounds baseball park. My first memory of it was when I, aged 9, tried out for a little league team. I vaguely recall a flock of kids being divided into groups, then going from station to station where we were tested on our ability to field a ground ball, catch a fly, and hit some soft tosses. I was pleased when I heard at the end of the day that I had been selected to play on McIlroy Bank team and I remained on that team for the next four years. 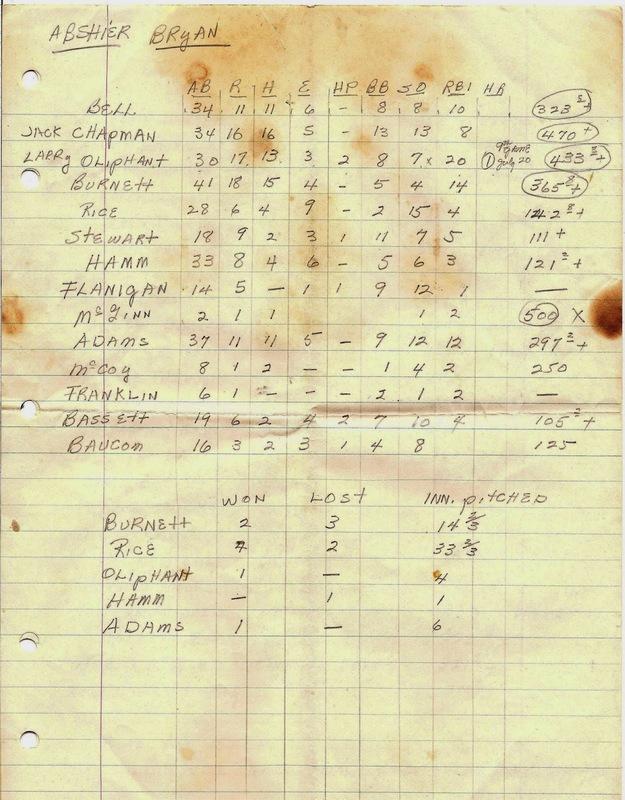 Among my coaches during those four years were Tony Adam's (FHS '65) dad, Charles Crittenden's (FHS '65) brother, and Steve Halliday (FHS '65) data. During the last four years I played oranized ball, the home games were at the fairgrounds park. Three of the years were playing American Legion ball; the fourth year was playing on the Razorback's freshman team. I was sad several years ago to find out that the park had been demolished.